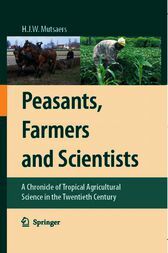 This book is a critical account of tropical agricultural science in the twentieth century, with its successes as well as its fads and failures. Its coverage reaches back into the beginning of the twentieth c- tury, but the second half of the century takes place of choice. Which means that the story is closely linked with that of post-co- nial development and scrutinises the role agricultural science has played (or failed to play) in the advancement of the tropical sma- holder, in particular in Africa. The book was written from the perspective of a practitioner, with the inevitable result that the treatment is skewed by this prac- tioner’s own experience. That is an obvious drawback of a pers- alised account, but not a serious one I think, provided the author manages to make up for that disadvantage by getting across to the reader the thrill of his direct involvement. A wide range of topics are covered, including interesting early science from the beginning of the last century (sugarcane breeding and shifting cultivation in Indonesia, anthropological studies in German West Africa), fascinating indigenous farming practices in Africa, the history of Farming Systems Research and its offshoots, computer modelling of crop growth, and the role of development projects, donors and consultants. The author, who graduated from Wageningen University in the Netherlands in June 1967 and obtained a PhD degree there in April 1982, has spent a lifetime working in a wide range of tropical agronomy-related fields. He started his career in a cotton development project in Indonesia, lectured and carried out research at the Universities of Wageningen, Yaoundé (Cameroun) and Ibadan (Nigeria) and played a key role in the introduction of the ‘Farming Systems Research’ approach in West and Central Africa when working at the International Institute of Tropical agriculture in Ibadan. Since 1994 he has been attached to the Nedworc Foundation in the Netherlands and travelled to many African, Asian and Latin American countries to formulate, assist and evaluate agricultural research and development programmes. Dr. Mutsaers is the author and co-author of numerous scientific papers on crop physiology, crop modelling, farming systems and on-farm research, as well as several books, including two on on-farm research methodology.